All across the country, teachers, business people, parents, sports coaches, and more are ditching the chalk easels, patching the holes left from hanging whiteboards for good. What’s the alternative? They’re writing directly on walls and tables! Dry erase paint is a relatively new concept, but still there are quite a few brands available for purchase in big box stores and online. While there are some nuanced differences between various products, the way each works and the typical uses are mostly universal. Essentially, dry erase paint is a smooth, hard drying finish that allows any surface to adopt the properties of a dry erase board. There are clear or white options, and some brands, like Remarkable, are even magnetic! So why would someone want a dry erase wall? There are a lot of benefits to choosing dry erase paint over a hanging board. First and foremost, you are never limited to the confines of the board when your entire wall is dry-erasable. Moreover, customization is installation! How much surface area do you need? Mark it and paint it. Need more later on? The gallon is sitting out in the garage! Pop it back open and create even more work space! You also never have to worry about finding studs and drilling into walls in order to hang those cumbersome boards. Possibly the coolest way dry erase paint is being used is as a clear top coat for tables and desks. Imagine sitting in the office conference room for a big meeting, jotting your notes right on the table in front of you, and then, just as the meeting is about to end, snapping a photo of your work space and erasing. Dry erase paint presents has the opportunity to become the eco friendly wave of the future in offices and schools throughout the country. No longer would students, teachers, or parents have to hustle around on the week before school stocking up on heavy, cumbersome notebooks and binders, and employees could rid themselves of task management planners for good! So now that you’re ready to take the next step into the world of limitless dry erase work space, what are the best brands to buy and what should be considered before you make a purchase? In this article, we’ve outlined five dry erase paint brands by price and functionality so that you have all the market research you need to make an informed purchase. 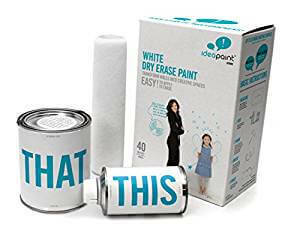 IdeaPaint’s dry erase paint comes in a kit that requires some mixing. This sounds like more work than it perhaps should be but they really make it super easy. Simply mix this with that. No literally! The two component chemicals that make up the dry erase finish are labeled THIS and THAT. The kit covers up to 40 square feet, is environmentally safe, and virtually odorless. 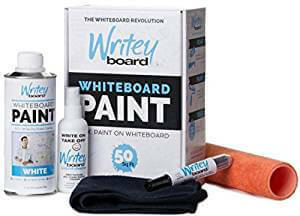 Writeyboard boasts that it is the only no mix, 1-part whiteboard paint. While this is not entirely true, it is definitely worth checking out for this exact reason. The “kit” includes the paint itself, an application kit with roller, a marker, eraser, and spray cleaner. Writeyboard covers 50 square feet with one kit, which is 10 square feet more than IdeaPaint. If that isn’t enough, Writeyboard is a Shark Tank product backed by none other than Mark Cuban. Rust Oleum is the old reliable when it comes to obscure paint products. This product is the cheapest. It is a mix like IdeaPaint, that does not come with any bells and whistles like the previous two brands mentioned. That said, there are some clear instructions on what you would need. Purchasing these separate would still put the total project cost under the direct cost of IdeaPaint and Writeyboard. 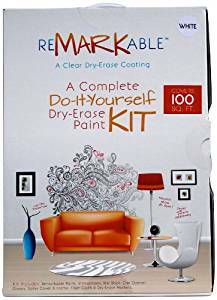 Remarkable has sort of made their name as the dry erase paint specialist. Their kit provides a lot more coverage (100 sq. ft.) but it is also significantly more expensive. The product is non toxic and markets itself as having the highest rated erasability and durability of any of the dry erase products. Remarkable’s kit is not a mixing kit, but rather includes some essential tools, much like Writeyboard’s. With the paint you get a roller, stir stick, can opener, gloves, markers, and eraser cloth. Remarkable also claims it has the fastest dry time at 48 hours, though Rust Oleum’s is only 1 hour without curing. 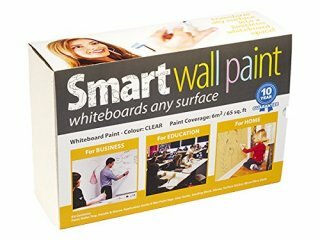 Smart Wall paint is transparent dry erase coat. This is important as some of the other products mentioned are truly white. 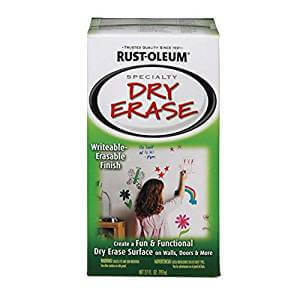 That said, Smart Wall and Rust Oleum, the clear coats, are best for painting desks and other furniture if that is what you are looking for out of your dry erase paint. Smart Wall costs $236, putting it at the higher end price wise. One kit gets you 65 square feet of coverage. One cool thing about this product that distinguishes it from the others is the 10 year guarantee on the surface of the paint. As you can see, there is no shortage of options for dry erase paint. That said, each has some small differences that are important to take into consideration. The biggest factors to look into before you make your decision are those with respect to intended use. For example, if you are painting furniture like a desk or table top, you will need clear coat dry erase paint. If you want a white wall, then those products that go on truly white are fine. The size of the area you would like to make dry erase and what each product offers in terms of coverage is also of importance. The most expensive, Remarkable, offers the most coverage in a single kit at 100 sq. ft. All the others fall somewhere around 50. From there, the last consideration to make is that of price. This is a market where prices vary dramatically. Without a ton of product reviews it is difficult to tell which are worth the money. Ultimately, it is best to start at the less expensive product and work your way up should those prove insufficient.